Great Ocean Road icon, The Pole House, Fairhaven. 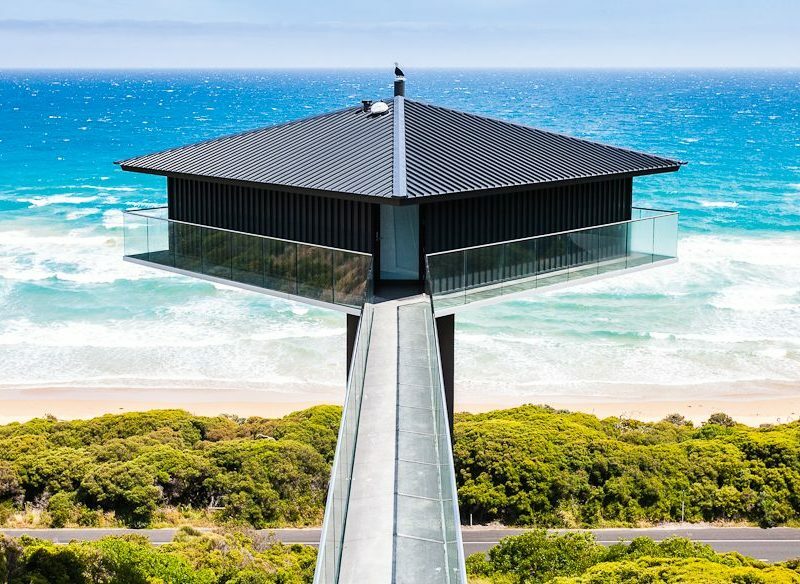 An icon of the Great Ocean Road, the Pole House is one of Australian Traveller Magazine’s 100 Great Australian Holiday Homes. Making your way along its floating walkway, this unique piece of architecture looks as though it’s hovering. Supported by a single, hulking steel pole, the Pole House is something of an icon perched above Victoria’s Great Ocean Road in Fairhaven. And it has been ever since it was first built in 1978. However, the original, mostly wooden structure was starting to fall apart due to the sea air. The new owners made the decision to demolish it in 2013 and replace it with a state-of-the-art construction that stays true to the original architect’s vision. Unveiled last year, it’s a minimalist, luxury take on the building that will see it stand the test of time. The interior is now a modern masterpiece; one of the major changes that architects F2 made was to install floor-to-ceiling retractable glass walls on the ocean-facing side to make the most of the stunning views of Aireys Inlet, stretching all the way to Lorne, with the Southern Ocean beyond. A glass, vertigo-inducing balcony also surrounds the property. Other sleek touches include a floating fireplace (how apt) and a wall of burnt ash timber to hide the supporting steel pole. The best thing about all of this? You can have the place all to yourself. With one bedroom it’s the ultimate romantic weekender. Book your spot at Great Ocean Road Holidays from $3080 a week. 1 for a newly renovated property the lack an exhaust canopy in the kitchen meant you couldn’t cook anything without setting off the smoke alarm, so the main siding glass door needed to be left open for cross ventilation. 2 lack of simple cooking facilities like a 2 burner electric cooktop, instead there was thus plug in the wall induction cokktop with no instructions & so hard to use. The burner was burning the middle of the fry pans, we couldn’t even enjoy a cooked breakfast without a burnt flavor. 3. We were supplied one towel each, half size of a normal bath towel & very thin. These things sort of ruined the experience a bit would hate to stay long than 2 days.